Isn't it crazy how a little app called Instagram and the crazy online journaling we call blogging can teach you so much? Lead you to discover treasured treasures. Broaden your shopping horizons. If it weren't for a little square picture or blogging, I would have never heard about one of the GREATEST online shops for personalized, handmade clutches in all the universe! The universe is a pretty big place, so when I use that term, I mean business. When Maddy Nash contacted me for this review and giveaway, I almost flipped backwards out of my chair. I came across this shop several months ago and never dreamed that I would be lucky enough to have one of these bags all for myself. This is my kind of lottery winning. I cannot say enough times how much I love the fold over clutch I designed. The quality, leather and fabric are stellar. Without fail, I get compliments every time I carry it, which has been quite often since it came in the mail. Now, Maddy Nash wants to give one lucky reader a winning lottery ticket, for free! Let me give you a quick run down. All clutches are made to order and produced in the U.S of A. They have been featured in places likes Southern Living Magazine and in Giuliana Ranic's hand! 10% of sales are donated to The Ronan Thompson Foundation. It's called "Do Good Fashion." Each clutch comes with a personalized label inside the bag that YOU create. Over 20 fabrics to choose from. Think chevron, dots and modern prints. Four leather options for fold-over clutch styles. And here is the kicker. Let me warn you, this is going to consume at least 30+ minutes of your time. You can go right this second and design you own custom clutch with the real time designer feature. Pick your leather, pick your fabric and design until your heart's content. This is like grown up paper dolls! I spent a good hour creating all kinds of combinations. One lucky reader is going to win $75 to Maddy Nash. Holy amazing, right? Maddy Nash will be offering 15% off to all of my friends. Use the discount code SHANNA at checkout. This offer is valid until March 31, 2013. Annnd I like the Fabric Foldover Clutch in Lattice Black! Love it all! And the clutch is a beauty :) I would definitely follow in your footsteps and get the leather fold over. SO CUTE!!!! So many too pick from! I like the Personalized Modern Clutch Purse with the Black/White Chevron. Love the clutch you made! I'd probably choose the fabric foldover in the same print you choose with a black zipper! Thanks for the hosting the link-up and for the chance to win! I love the blue leather with the plum leaf material. So cute! that dress is so bright. but i love it! i love how the scarf almost became part of the dress. its super fab! Gorgeous clutch! I love the leather foldover style! Oooh I can't decide which color but I love the foldover design! Love the Fabric Foldover!!! So cute!! And I get to pick the fabric...um yes please!! PS...LOVE your dress!!! It's beautiful on you!!! Thanks for hosting! LOVE your cute bright outfit. And those shoes, so lovely!! Wonderful clash of colours. You are and look fabulous. You are looking fabulous i love the bright colors in this outfit!! so cute! they make me want spring even more!! I wore the same dress, with the same combination, around the same time last year! So funnyy! Love how you styled it, Shanna! I love the pink scarf! I would choose the fabric fold over in Greek Key Grey! Ooohhh!!! I LOVE the fold over clutch with custom label. These colors are amazing together - so bright and sunny!!! Hi Shanna! Today is my first day linking up for Random Wednesday. I can't believe it took me so long, I've seen your blog mentioned on a lot of other sites (Heart Shaped Sweat is one of them). This outfit is fantastic and I simply adore your scarf. Thanks for hosting the link up, I'm looking forward to meeting other bloggers through it! Fun giveaway! I don't know if I would do the fold over or the modern clutch because they are both adorable. I think this would take A LOT of thinking because the choices are endless! I love the one they sent you (or did you design it yourself?) And I'm digging the scarf with the belt...need to try that style soon! Love the leather fold over clutch. And all the fabrics are so gorgeous! I don't even know which one I'd choose! Such a bright and beautiful outfit! Love that clutch. Holy brightness, Batman! I LOVE this outfit, and I love that clutch - tres cute. It's like you're made of candy today. Suh-WEET! i love the scarf belted like that!! and those bright colors too!! I LOVE your bag!! I want it! I love this whole look too. The bright colors are perfect. Shanna what an awesome look. I've been crushing on neon for quite some time now. I can't believe I've missed that dress at Old Navy. You look great! I had never heard of Maddy Nash before but I can already tell this is going to be a problem for my wallet! I'd get the leather and chevron foldover clutch! This outfit makes me think spring. Love it! Ok I love this bright outfit! And that clutch -- so perfect and gorg!!! Great colors! And, I love the scarf in the belt look!! After checking out the purses...I would choose the fabric foldover clutch. These bright colors suit you so well! And that bag is swoon worthy! the clutch is really pretty. and i love the color combination of your outfit, it scream like spring or in the case of my country summer as we are already summer season here. I like the clutch purse! I'd pick a chevron for sure!!! I love the leather ones! With a cute chevron accent! Um I totally want to win the lottery! So cute! I don't even know where to begin, there are so many great fabrics. But the Greek Key stands out as a winner. I love the modern clutch purse in the ikat dot in pink! So Cute! I would choose the fabric foldover in grey sticks. What's not to love?! I really like the idea of creating a unique bag, but I'd probably just end up getting the same one as you - it's awesome! I have also wanted to say your blog is one of my absolute favorites cuz you tell it like it is - no phoney-baloney goin' on over here ;) Have a good one Miss Shanna! I would definitely pick the cloth foldover clutch. I've been wanting a foldover clutch for a while! I love the leather fold over clutch!!! these colors are just amazing! I love these clutches. I would design a leather fold over with a chevron design and pink zipper. You look amazing. I love the neons. And the clutch is FAB. I totally just spent 20 minutes playing on the site. I love the outfit today and that bag! I would prob want the black leather one too...not sure what pattern for the strip in the middle though! SO cute! Fabric fold over clutch with the black polka dots! I have found soooo many great retailers as a result of blogging. I adore your whole outfit, but the clutch is probably the best part! Love the pink and green together. If I win, I will probably choose the leather fold over clutch! I love the foldover clutch with the green chevron and orange inside! You always look fabulous! Love that clutch! LOVE! i'd get the black ikat dot fabric foldover clutch!!!!! What a cute combination of colors! I just love the modern clutch, just something about that shape, with wavy navy and a yellow interior. Love the Fabric Foldover Clutch! I really like the Indian Summer pattern. I'd probably do the foldover fabric option. What a great concept! Would love a leather fold over clutch if I won. I love the leather fold over clutch with the chevron!!! So cute. I'd pick the Maddy Nash Modern Clutch with the Chevron Key Line and deep purple interior fabric with the added 24in chain and loops. That website is so cool! I love that you can see it as you do it! I picked black leather with black and white fabric and a cobalt blue zipper. Now I'm sort of obsessed and hoping I win.. or else I'll probably be buying one! definitely the modern clutch purse!! I was going to comment that I loved your purse, so I was of course thrilled that it was a giveaway! I would choose the Fabric Foldover clutch in Wavy Navy with the yellow/chartreuse zipper and interior fabric. So cute! eeeeeek i loveeee them! i would totally get one with chevron and leather! I LOVE this outfit! Currently searching old navy's site for that dress right now! Love the foldover leather clutch! Fabric foldover clutch in wavy navy! Your bag (and entire outfit!) is amazing...I'd just pick that bag since I can't choose! So cute! I love the foldover leather clutch! That clutch is pretty cute! Future career as handbag designer? Love, love, love the whole outfit especially the clutch!!! I would pick the Leather Foldover Clutch With Custom Label. I like the gray one online but also really like the one in your pic. I love the chevron modern clutch! So cute! honestly...I would be a copy cat and get yours!! LOVE these! I'd go with the Leather Foldover Clutch in grey leather with golden leaf fabric and a cobalt blue zipper...OR grey leather with crate black fabric and a hot pink zipper! SO adorable! I love all the bright colors in this post- makes it almost feel like spring is here! too cute! love the pop of pink! It's so hard to choose but I'd probably choose the one you did with cobalt zipper:) But I also like the chevron-so many cute prints and colors!!! Oh my goodness! I love this! So colorful!! I don't know what I love more! That clutch? Or the way you tucked your scarf into your belt! I would love to design my own! Oh the bright green and pink are to die for. Wow Shana those colors are so beautiful and springy!! I love it! Also, isn't it great how we can discover so many new, wonderful places just by surfing the web? The clutch you chose is ah-mazing. If I won the gift card, I think I'd just copy that one because I'm seriously in love with it. You have great taste! Love the gray leather with Indian Summer chevron! I love all of them, but I'm drawn to the Leather Foldover Clutch With Custom Label. Thanks for sharing a made in the USA item! You ate very bright and sunshiny today. This must be the start of your spring influence. I love the foldover clutch! so cute!!! I love the neon yellow and pink! The belt around the scarf is so chic! I can;t believe that purse company, it looks like they make incredible items! Thanks for hosting! I'd go with the leather foldover. LOVE!!! I so need this clutch in my closet! Ooo I desperately want the foldover clutch! What an amazing giveaway! You look lovely and bright! Great clutch (I hear people keep saying that!) Thanks so much for hosting and have a fabulous week. I would choose the modern clutch in the teal geometric pattern with the green interior. Love all of the bright colors. Makes me so excited for Spring. Love your blog! Ohh my gosh this outfit - I am sooo in love! 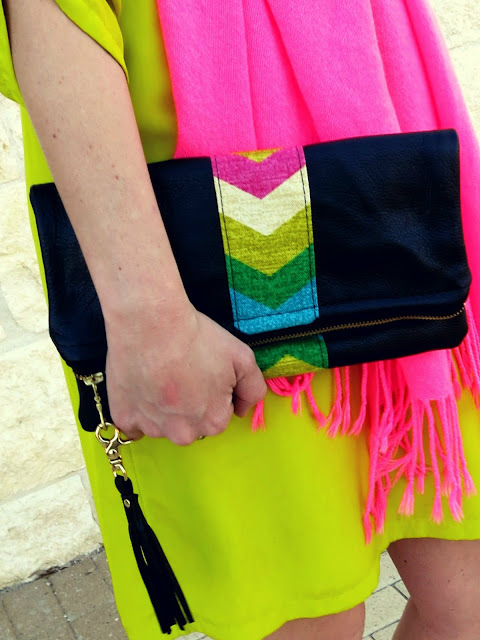 I love all the brights together and I am OBSESSED with this clutch! How great is social media that we can find places we otherwise never would have known of?! I am off to check off this shop STAT (and enter the giveaway)! Giveaway entry - I would put the credit towards the customized leather foldover clutch - I'm thinking grey with green/white chevron and bright yellow zipper! love your dress Shana! i searched for that color at my store last spring and grabbed the hot pink one instead! Thanks for a lovely giveaway! I would love to get the modern clutch purse in Lattice Black with Pink interior. These purses are so beautiful, I hope I'm the lucky winner! Can I say that I LOVE this site. I am a mother of 5 and have been in business management for 15 years. I recently became a Work at home mom....and that has meant some pj days. You are inspiring me to get dressed up for no reason at all! I am having a linky party on Friday at http://www.frugalfitfamily.com so bring your stylish self over and linkup! LOVE THE BAG! v Personalized Modern Clutch Purse With Custom Label for sure! I'd get a clutch in the wavy navy pattern! so cute. I would get the Leather Foldover Clutch With Custom Label! Love Maddy Nash! I first starting following them on FB after seeing Veronika's Blushing post about them. It was fun to see you on their FB today Shanna! Congrats! I would love a leather foldover clutch from them! Totally love all the beautiful colors! You look great! I love your bright colors here...that clutch is perfection!! Because yours is perfection I'd probably be a copycat if I won! I love your bright colored outfit so much, and it makes me want spring even more! I love the fabric fold over clutch in the black chevron with a pink lining. Beautiful! I LOVE the entire outfit. The fun scarf color with the green dress is so cheerful. And the bag you put with it just pulls it all together! This bright outfit is great! You look amazing! I would get the Golden Rod leather, Golden Leaf fabric, and a navy zipper. SO great! I love the bright neon colors in your outfit! 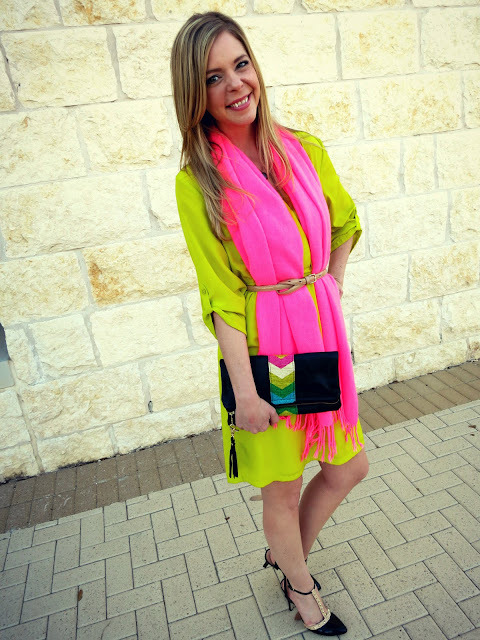 The touches of neon in the clutch is perfect! I like what you designed. I adore the fabric fold over, probably choose that one. I love the foldover clutch in Indian Summer! Teach me, fashion queen!! I can sell cookies like no one's business, but fashion is a foreign language to me. Great outfit! Loving the colors! You gorgeous girl! I love your bright neons and would pick a clutch just like yours! count me in! I like the foldover clutch in crate black! OMG, you are calling the Spring early!! So so so beautiful..love the colors in this outfit! Hope you are having a wonderful day! Thanks so much for this link-up opportunity!! I love discovering new blogs! I like the leather foldover clutch in gray leather with the black and white lattice print with a hot pink zipper. I love the Leather Foldover Clutch. Thanks for the giveaway!! OMyGosh! Shanna! You have the crazyiest blog hop ever and your Give-aways are addicting. yay! I love your purse!!!!!!!!! I went and designed my clutch! Hope I win so I can buy my design. I think I would want the foldover clutch too. These are too cute! And I love the green/pink combo you have going on.... definitely one of my favorite combinations! What a cute clutch!! I need one in my life!! Love the colors! It would go with so much. So cute! I love the clutch purse and the motley design! Oh my gosh...this bag is stunning! It pulls the whole outfit together soooo nicely! So glad you "won the lottery" And those colors look fantastic on you! I love the fabric foldover clutch in wavy navy! So cute! I think I would choose one of the leather foldover clutches from Maddy Nash! I love all of these colors. Hello spring! I really really love this outfit! I don't think I ever would have thought to put these two brights together-but I love the way it came out! i would get the clutch with black lattice exterior, red interior, and red zipper. I love the foldover clutch! I love the foldover cluth in Crate Jade with chartreuse lining. Oh I hope I win! I adore the leather fold-over clutch! SO CUTE! Thanks for the giveaway, girl! Your blog is so precious. I would choose a Personalized Modern Clutch Purse With Custom Label. Loving the bright colors for spring! I'd choose the Fabric Foldover Clutch Purse With Custom Label in Greek Key Grey! Thanks for the chance to win. I would choose the fabric fold over clutch purse !